Element Six, the world leader in synthetic diamond supermaterials, working in partnership with academics in Harvard University, California Institute of Technology and Max-Planck-Institut für Quantenoptik, has used its Element Six single crystal synthetic diamond grown by chemical vapour deposition (CVD) to demonstrate the capability of quantum bit memory to exceed one second at room temperature. This study demonstrated the ability of synthetic diamond to provide the read-out of a quantum bit which had preserved its spin polarisation for several minutes and its memory coherence for over a second. This is the first time that such long memory times have been reported for a material at room temperature, giving synthetic diamond a significant advantage over rival materials and technologies that require complex infrastructure which necessitates, for example, cryogenic cooling. The versatility, robustness, and potential scalability of this synthetic diamond system may allow for new applications in quantum information science and quantum based sensors used, for example, in nano-scale imaging of chemical/biological processes. "The field of synthetic diamond science is moving very quickly and is requiring Element Six to develop synthesis processes with impurity control at the level of parts per trillion  real nano-engineering control of CVD diamond synthesis. We have been working closely with Professor Lukin's team in Harvard for three years - this result published in Science is an example of how successful this collaboration has been." "Element Six's unique and engineered synthetic diamond material has been at the heart of these important developments. The demonstration of a single qubit quantum memory with seconds of storage time at room temperature is a very exciting development, which combines the four key requirements of initialisation, memory, control and measurement. These findings might one day lead to novel quantum communication and computation technologies, but in the nearer term may enable a range of novel and disruptive quantum sensor technologies, such as those being targeted to image magnetic fields on the nano-scale for use in imaging chemical and biological processes." The findings represent the latest developments in quantum information processing, which involves manipulating individual atomic sized impurities in synthetic diamond and exploiting the quantum property spin of an individual electron, which can be thought of classically as a bar magnet having two states: up (1) and down (0). However, in the quantum mechanical description (physics of the very small), this quantum spin (qubit) can be both 0 and 1 simultaneously. 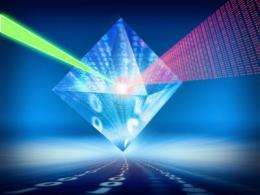 It is this property that provides a framework for quantum computing, but also for more immediate applications such as novel magnetic sensing technologies. More information: The results of the research appear in an article in Science magazine, published 8 June 2012. "Quantum Information Storage for over 180 s Using Donor Spins in a 28Si 'Semiconductor Vacuum'," by M. Steger et al. "Room-Temperature Quantum Bit Memory Exceeding One Second," by	P.C. Maurer et al.